FUNDRAISING GOALS: We are raising $10 million for two building projects, the restoration of the 19th century farmhouse for reuse as a museum, the construction of an Interpretive Center, and landscaping. Through a grant from the Pennsylvania Historical and Museum Commission (PHMC), DFCLT has recently completed a Historic Structures Report on the nineteenth century farmhouse (built circa 1825) on the site. With this report, we are currently raising money for the restoration and reconstruction of the fragile farmhouse for reuse as a museum. Visitors will have an opportunity to tour permanent exhibitions in the house, including vintage photographs, 19th century family artifacts, a Perkins-Dennis Family Tree similar to the Perkins-Dennis Family Family Tree in the exhibit about the family in the Smithsonian’s exhibition, Through the African American Lens; and a timeline of the generations of the Dennis Family within the context of the historical times in which they lived. In 2015, heritage and museum planning professionals toured the farm and, at a planning meeting, shared their expertise for the development of an Interpretive Plan for the Dennis Farm. 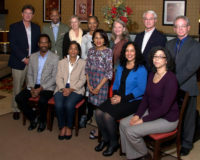 In 2015, DFCLT received the Chairman’s Award from the National Endowment for the Humanities to host a meeting of heritage planning professionals from across the county to advise and make recommendations about how to best interpret the farm to the public. Thanks to a grant from Pennsylvania’s Department of Conservation and Natural Resources (DCNR) through our partnership with the Endless Mountains Heritage Region, we followed through on those recommendations and hired a professional team from The Commonwealth Heritage Group who, in 2017, completed an Interpretive Plan for the entire 153-acre Dennis Farm in order to maximize the farm’s importance as a heritage, environmental and educational destination. The plan includes a detailed blueprint for the transformation of the farmhouse to a museum. Video loop to tell the story of the farm from the family’s background in 18th century New England to the present. Research Facility: The DFIC’s digital library will be the repository of literature and documentation about free African Americans who, like the Dennis family, lived in the North during the colonial period and between the end of the American Revolution and the Civil War. There is currently no one location where this information can be found, as it is a fairly new area of research. Introduction to the Farm: The Interpretive Center will be the place where visitors learn the story and significance of the farm before they begin their tour of the site. Public Events: We will, also, hold programs and special events, like our annual symposium, in the Interpretive Center. Among the special events and in keeping with the farm’s extraordinary history, we plan to include programs that address best practices in bridging the racial divide. Constructing view sheds that offer perspectives on the spectacular mountains surrounding the farm. Our plans include planting a garden with samples of crops that were grown on the farm in the 19th century, based on the farm’s 19th century agricultural census records. Since, according to the 19th century agricultural census, orchard products and maple syrup were among the farm’s major products, we will plant new trees in the apple orchard and maple tree grove. Landscaping will also include a flower garden based on vintage photographs of the farm. 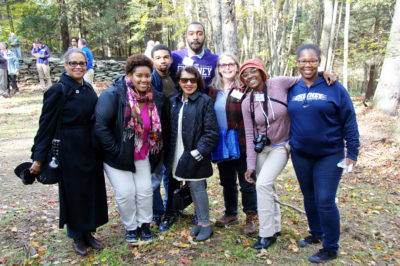 Photo left: Students from Cheyney University of Pennsylvania attend the Dennis Farm Symposium in 2014. Photo right: Landscape Architecture students from Pennsylvania State University, University Park on a field trip to the farm in 2013. We plan to continue to develop educational programs on subjects related to the farm, from History to the Environment. Education is central to the Dennis Farm Charitable Land Trust’s mission. We have an ongoing partnership with Keystone College in La Plume, PA, which is near the farm. Trained student docents from Keystone give tours of the farm to our visitors, Keystone College hosts our annual symposium program and luncheon, after which attendees who come from the local community, across the Commonwealth, and out-of-state tour the farm, and the college has hosted two Dennis Farm Exhibitions. In 2018, we will host a summer concert on the lawn of the farm, as part of Keystone College’s 150th anniversary celebration. We are also developing educational programs with the college. Through the generosity of Keystone College’s President David Coppola, PhD, DFCLT will have space at the college for our Interpretive Center until we construct one on the farm. The Dennis Farm Interpretive Center at Keystone College opens in October 2018. We have had individual educational programs with various colleges and universities. 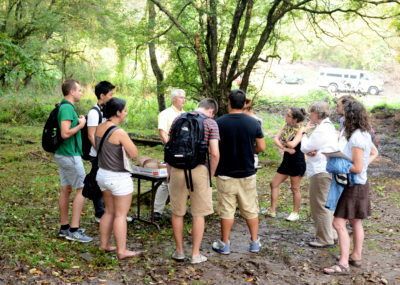 In 2008 and 2009, the State University of New York (SUNY) Binghamton’s Department of Anthropology conducted an archaeological field school at the farm. Under the direction of doctoral candidate, John R. Roby, Binghamton students excavated approximately 10,000 artifacts. 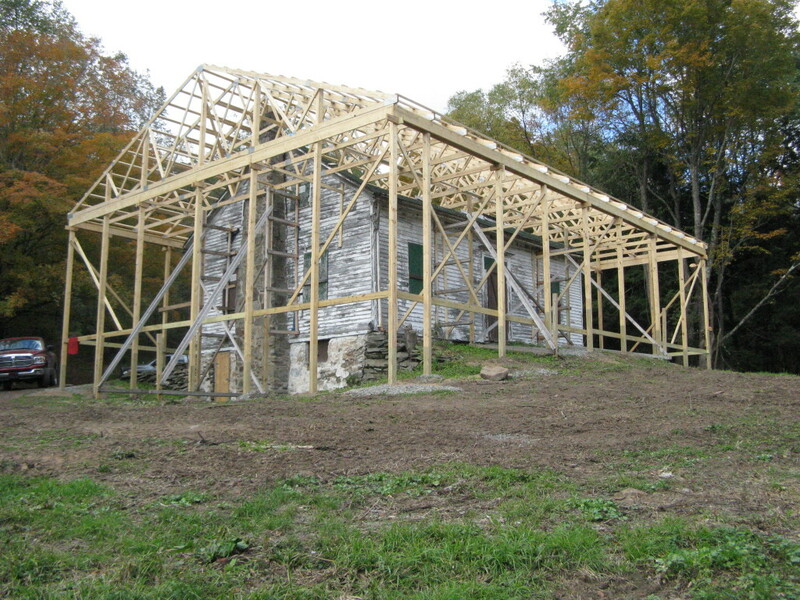 Roby’s dissertation, Memory, Practice and Process at the Perkins-Dennis Farm, a 19th Century Free African American Farmstead in Susquehanna County, PA is based on his work at the Dennis Farm. Since receiving his dissertation he has been teaching and co-edited a book Excavating Memory that includes a chapter about the Dennis Farm. The Dennis Farm Charitable Land Trust has partnered with Drexel University, Pennsylvania State University at University Park, Cheyney University of Pennsylvania, and the University of Delaware on individual programs and projects. The farm offers infinite educational opportunities. For example, we would like to work with a university on identifying the species thriving in the wetlands on the farm and to identify and catalogue the variety of wildflowers in the farm’s copious fields. With the guidance of DFCLT Board members Patrice Jeppson, PhD, and Wade Catts, MA, RPA, we are currently working with the Superintendent of the Mountain View School District to develop an educational program that will include the history of the Dennis Farm in the local curriculum. In 2018, we will also meet with representatives of the School District of Philadelphia to develop a plan for incorporating the history of the farm in the Philadelphia elementary and secondary school curricula. We are also seeking funding that will enable us to transport elementary school students to the farm on field trips where they will experience the countryside first hand and learn the farm’s history.